Does it support Google updates in future? Yes, and the latest Android Oreo 8.0 already supported. In case there's problem, Please contact seller with new firmware to compatible with your Pixel phone. 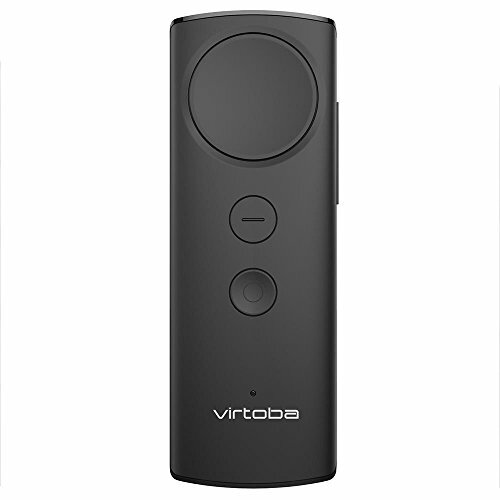 This VR controller could only compatible with Android system, It does not support iOS devices. Feel the adrenaline rush as you speed down the racetrack. Bowl a strike with a swing of your arm. Cast a spell with your own magic wand. Every Virtoba product includes 12-month Worry-Free Warranty, free life-time technical support. MOTION EXACTLY SYNCHRONIZE WITH VR WORLD.High precision 9xIMU sensor, Support three degrees of freedom to track and be sensitive to the direction of your motion. ERGONOMIC DESIGN, HOLD MORE COMFORTABLE. Ergonomic Design, hold comfortable, support long time game controlling. FULLY COMPATIBLE WITH DAYDREAM AND ANDROID VR MOTION SENSING GAMES. VR built in Android wonderful motion sensing games. and compatible with Daydream motion sensing games, playing without stop.Note:This VR controller could only compatible with Android system, It does not support iOS devices. INCLUDE.1 x Bluetooth Controller, 1 x Type C cable, our hassle-free 12-month warranty and excellent customer service. Compatible with Deepoon VR SHINECON Nibiru VR Headsets VR Game Handles. If you have any questions about this product by Virtoba, contact us by completing and submitting the form below. If you are looking for a specif part number, please include it with your message.